What I find interesting having followed the outcome of TechCrunch disrupt is the fan-fair around GetAround, the startup dubbed as AirBnB for cars, particularly from investors who missed out on AirBnB which just received $100m in funding at a $1bn plus valuation after a series A of $7.2m. GetAround are in a great position. They are riding the emotional springboard of investors who may have dismissed GetAround had they attempted to raise funding pre AirBnB. The similarity of their business model to AirBnB’s has already validated the concept in the minds of investors and those investors don’t want to miss out second time around. It was probably not GetAround’s intention to generate interest this way however luck and timing play a major role in success and here is a perfect example of preparation meeting opportunity. Hindsight is 20/20 and the investors who back GetAround are doing so not only because it is a great idea but because AirBnB has helped them predict what might happen in the future. 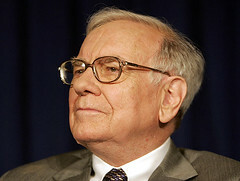 If Warren Buffett could improve his competence, where would it be? Q: If you were going to live another 50 years and could add one additional sector or asset class to your circle of competence what would it be? I would say it would have to be something in the tech field. I think that would be terrific but it isn’t going to happen. It’s going to be a huge field. There are likely going to be a few winners but a lot of disappointment so that the ability to pick the winners in technology is going to be disproportionately more difficult than picking the winners in, say, the major integrated oil industry. The degree of disparity of results among large tech companies in the future is likely to be very dramatic. If I had the skills where I could pick the winners there I would do much better than if I had the skills to pick the winner in the major integrated oil industry. I’ve been watching Netflix‘s share price with awe over the last 2 years. The share price increased steadily from 2004 through to 2009 however recently it has gone ballistic with a 12 month and all time high of $254. Why? Because of scalability and distribution. In the early days Reed Hastings had a dream of centralising Americas DVD rental business. He built a state of the art distribution centre and acquired as many customers as he could. During this phase however, there was significant capital and expertise required to get the business off the ground to ensure a timely and accurate distribution service. Netflix quickly became one of the US postal systems largest customers and had to emulate their sorting and dispatch systems in many ways, which of course meant that capital expenditure was exorbitantly high, maybe out of control, in the first few years making free cash-flow non existent with a persistent need to constantly raise more capital to grow the bricks and mortar infrastructure, distribution and warehousing necessary to power the DVD delivery model. However in October 2009 they made their first partnership announcement with Sony Entertainment which would set a new path and growth trajectory for the business moving forward. The partnership agreements gave console users access to the Netflix service through the consoles operating system, so anyone with a console could immediately stream Netflix movies. This is what I believe to be the genius of Netflix. Instant access to exponential scalability. Literally overnight they increased their movie distribution business beyond the postal system, to millions of users worldwide. Netflix can now distribute streaming content globally to almost any device. The graph below shows the share price after their first digital streaming announcement with Sony’s PS3. The share has rallied from $54 to $229 since the 22nd of October 2009. In September 2010 Blockbuster filed for bankruptcy. Today you can stream Netflix on your Apple TV, iPhone, iPad, Playstation, HDTV (Sony, Phillips, Panasonic, Samsung & LG) , Nintendo Wii, Tivo, Roku, Boxee and Windows Phone, bypassing the need for physical distribution of DVD’s. The decision that Netflix made to go digital should not be underestimated. It was of course a decision that needed to be made, or else they would have fallen behind iTunes and Amazon Instant Video who are both aggressively pursuing streaming movie rentals. Apple and Amazon, however, did not have to sacrifice millions invested in physical infrastructure that will inevitably become redundant as the user base shifts towards a streaming model. That is the sacrifice of being the first mover. It takes balls to write off your old assets and point the ship in a new direction, however the fact is that Netflix did get a return on their hard assets. They won millions of customers by being first, and built a brand before the world was ready for the low cost streaming model, and now their customers are converting across to the streaming service at a rapid rate. In fact, Netflix just announced that 60% of their customers are streaming customers. Furthermore from some quick research: Australia, South America and much of the world outside of the US & Canada have yet to launch the streaming service due to content restrictions with the studios but I am sure they will eventually work their way through these problems.